Thanks to Schlader Photography for taking the school photographs! GRANGEVILLE — Rhett Mahoney’s career choice took a turn when he was at the University of Idaho. Mahoney started in architecture and ended in secondary education. “God has a way of changing our plans, of using us in his ways,” he smiled. Mahoney is the new principal at Sts. Peter and Paul School, starting in the position this school year. He was born in Casper, Wyo., and grew up in Buffalo, Wyo., until fifth grade when his family moved to California. His father was in the mining industry and they moved around quite a bit, he said. He graduated high school in Battle Mountain, Nev., then went on to the U of I. He spent three years in the architecture program prior to changing his major and obtaining his degree in secondary education with certifications in art and math, and also received his minor in architecture. “I had become involved in coaching and refereeing during college, and that really turned me to education,” he explained. He obtained his master’s degree in education technology teaching from the U of I as well. He is currently working on his certification in Catholic School Leadership from Creighton University. Mahoney spent more than 18 years in Moscow, Genesee and Lewiston, teaching and coaching. He and his family spent two years in Cavendish recently, living and working on a large farm when they made the choice for him to return to education. Last year he worked part time in the SPPS parish and also taught seventh-eighth grade for half a day before taking on the full-time principal position this school year. For the past decade, Mahoney has also served as the basketball official commissioner for high school and junior high for the region from Potlatch to Grangeville. Mahoney’s wife, Myja, homeschools the couple’s two youngest daughters, Sophia, 10-1/2, and Olivia, 9. They enjoy outdoor activities including camping, gardening, hunting and fishing. “We have a hobby farm in Mt. Idaho and are enjoying that experience,” he said. This includes four goats, a horse, 10 chickens and a dog. The couple also have two grown children and two grandchildren. Mahoney said he likes being able to live and discuss faith on a day-to-day basis and appreciates the parish for supporting Catholic education. This year there are 86 students at SPPS in preschool through grade eight. 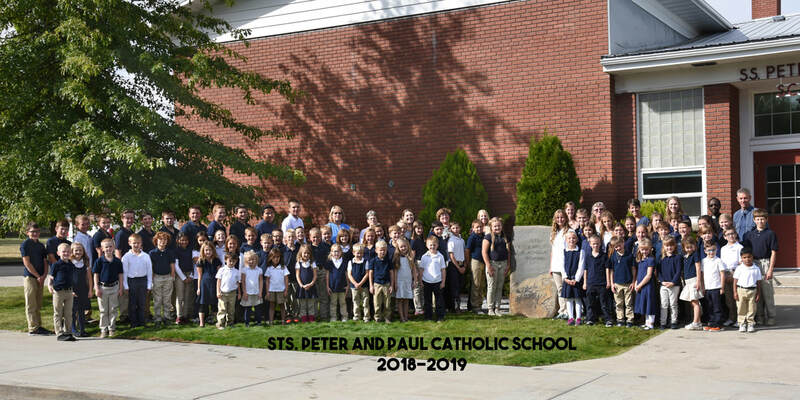 “We have devoted staff, parents, parish and community and I am enjoying the investment I am able to make in the faith development of our students,” he said. "I Appreciate" quotes that appear throughout our website were written by parents and have been published either in our school newsletter or on our Facebook page.